What do you do when you’re dealing with an emotional person? A really emotional person? It could be a customer, boss, friend, family member, or partner. Whatever the case, what do you do when they are emotional and you are not? Having been trained as a teacher, I usually enter into some sort of attitude of a classroom manager. I slow down my speech, assume a calm, confident voice, and talk rationally to the individual with monosyllabic words. It’s my first instinct. Yet it is so ineffective. And imperious. To describe this more clearly, consider the professional circumstance. When dealing with an emotional customer or an aggressive negotiator, I usually try to remind them of what I can and can’t do. This typically involves restating a position or reaffirming a decision they dislike. Because they’re usually screaming about that. So I feel like I have to restate it. As if they’ll miraculously understand when I utter the words a third time. In personal circumstances, if dealing with a friend or family member, I usually try to speak slowly, calmly, and offer those little reassurances that I wish could help. Some of these phrases feel patronizing when others say them to me. I wish that weren’t the case. Consider the following examples. What else can we do in these circumstances? One common tactic is to just listen to the emotional person. Do nothing, in other words. As they wrestle with their emotions, weeping or shouting to the sky, we do our best impression of an inert rock pile. We sit there, quiet and still. This isn’t a bad idea. But it’s not a good one, either. Especially when you’re dealing with a friend, family member, or child. It’s hard to sit there. It feels weird. Another tactic, which I have tried many times, is to pivot to action. This works occasionally in a professional setting. Not always, but sometimes. I don’t think it’s ever worked in a personal setting. Seems like a good gesture. And it can work when the timing is right. But we usually do this much too quickly. If the person is still emotional and we ask “What can I do to help?”, it puts a new burden on them. To ask an emotionally-overwhelmed person the question “What can I do to help?” is akin to asking them “What’s the capital of North Dakota?” You force them to not only struggle with their emotion but also answer a pop quiz. They have no idea how to enlist your help! Which probably makes them feel more helpless. And the spiral continues. A final tactic is to offer preemptive advice. Which is a bad idea. I think advice is crucial but it has to come later. You have to ramp up to it. Have you ever felt physically ill in some general way that is easy to describe but hard to diagnose? Some illnesses are easy to understand. A sore throat is a sore throat. But a nauseous feeling coupled with upset stomach and a headache? Put those symptoms into WebMD and you’ll find a thousand possibilities. Or what if you have severe joint pain that comes at random moments? Sometimes morning, sometimes evening, sometimes on consecutive days, sometimes not. These are very frustrating afflictions. Especially when you go to the doctor, get a full workup, and it yields no conclusion. I’ve experienced this firsthand with some very acute pain. I tell the doctor. The doctor then says “I don’t see any problems”. This is crazy-making. And embarrassing. Now consider the flip-side. You feel sick, you go to the doctor, they do an exam, and determine you have the flu. Thank goodness! What a relief! The flu! I’m not crazy for feeling this way. There is a strange sense of satisfaction that comes from someone naming our problem. A diagnosis of this sort is almost a cure in its own right. Thankfully, this dynamic can apply to emotional discomfort, too. When we feel deep emotional turmoil, it is akin to suffering the symptoms of a physical illness. The pain makes it hard for us to objectively diagnose ourselves. Or even acknowledge the way we feel. But if someone is listening to us, and keeping a calm head, they can offer the diagnosis for us. They can do something that therapists and hostage negotiators refer to as labeling. Of course I’m angry, the patient says. I don’t need you to tell me that! 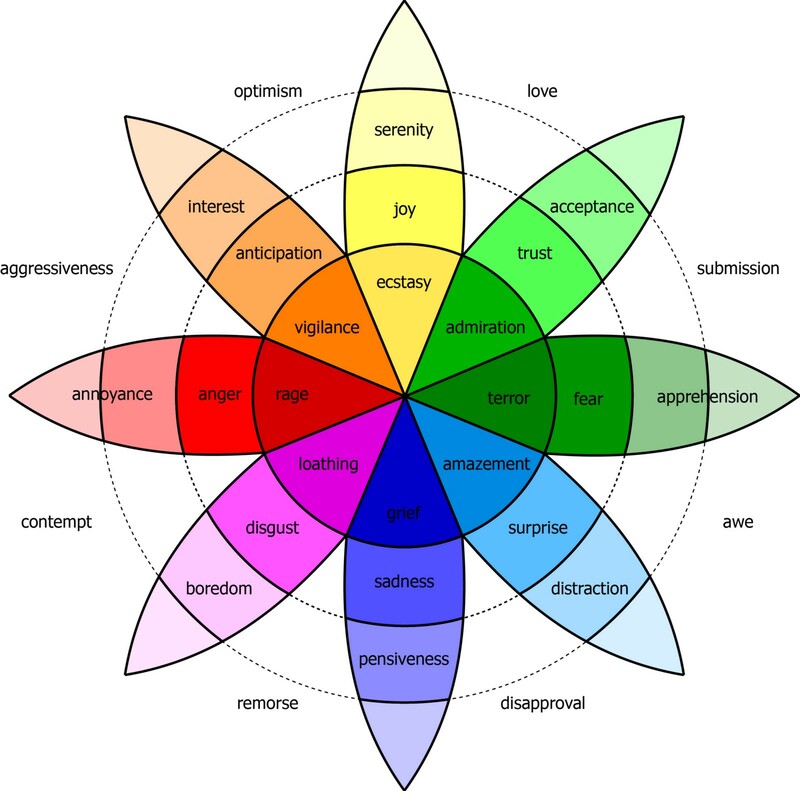 Putting feelings into words, or “affect labeling”, can attenuate our emotional experiences. [Labeling] produces a pattern of effects like those seen during explicit emotion regulation. This comes from their 2018 article in the curiously-titled academic journal Emotion Review. Disgusted? Is that the right word? Let’s assume the therapist is a professional and that this is, indeed, the right word. It is more nuanced than the word “angry”. And it is probably more precise in the given context. A precise, nuanced label strengthens the power of the labeling effect. Expanding the vocabulary expands the range of possibilities in the patient’s mind. So if “disgusted” is the right word, it unlocks a new pathway for the conversation. Disgusted? Yes! I’m disgusted! Because that was just morally wrong, that thing that happened. The therapist can then ask, What is it about this situation that feels morally wrong? From there, the conversation becomes more concrete, more tangible, and solutions can begin to emerge. Tactical empathy is understanding the feelings and mindset of another in the moment and also hearing what is behind those feelings so that you increase your influence in all the moments that follow. Are they? Maybe. Or maybe not. It might be that they aren’t annoyed so much as “furious”. If so, they’ll tell you. Which is great. Because regardless of the word, and regardless who determines it, the real benefit here is that the emotion now has a label. Labeling is a helpful tactic in de-escalating angry confrontations, because it makes the person acknowledge their feelings rather than continuing to act out. As soon as you label something, you change how people perceive it. You almost objectify the feelings. In a good way. Once the feelings are labeled, acknowledged, and objectified, you open the space for action. Why? Because you, the listener, have created a connection. That connection leads to a small modicum of trust or, at minimum, openness from the individual. Just as surely as a medical doctor can’t give you an antibiotic until they’ve labeled your infection, you can’t make a request of an emotional person until you label their emotion. And remember that these emotions aren’t just anger or frustration or disgust. It can be more subtle. In a negotiation, for example, the other party might feel apprehension. Or anxiety. Or uncertainty. So a great negotiator is like a great therapist in that they understand the broad array of emotions that might inform the other person’s thinking. The look for those emotions and help the other party label them. This is a great step towards resolution. If you listen effectively, as explained in yesterday’s post, and make genuine observations through the labeling technique, you can develop a fine-grained demonstration of empathy that leads to great tactical advantage. For the therapist, this tactical advantage leads to solutions for the patient. For the negotiator, it leads to requests for the other party to consider. Small wins emerge. Trust is gained. Progress is made. And for your friends and family, it might lead to something better than the usual ways we try to help. Remember you’re dealing with a person who wants to be appreciated and understood. You want that, too. You’ll get it by giving it first. Starting with a name.